The box that arrived from China was not small. Heavy and a little battered from transit, it held a precious treasure—32 volumes of Vinaya texts. Along with the gift came unexpected recognition for what we’re doing here at Sravasti Abbey. The texts are the annotated edition of the great books of the Nanshan Vinaya published by Longquan (Dragon Spring) Monastery in Beijing in December 2015. In a note that followed the offering, a Longquan monastic pointed out that Sravasti Abbey is following in the footsteps of great Buddhist monastics from long ago. The Vinaya is the collection of Buddha’s teachings that advise on ethical discipline, particularly outlining the trainings and practices for monastics and their communities. No small thing, the Vinaya is one of the Three Baskets of Buddha’s teachings, which also include the Sutras (discourses), and the Abhidharma (knowledge of phenomena) texts. What’s so special about these particular books? Written by Tang Dynasty Vinaya Master Daoxuan and accompanied by commentaries by Vinaya Master Yuanzhao and others, the eight great texts of the Nanshan Vinaya are fundamental texts for the study of the Dharmaguptaka Vinaya, the Vinaya school in which Abbey monastics are ordained. Over the past decade, Longquan Monastery Abbot Venerable Xuecheng and his students have painstakingly added word-by-word explanations to these texts in modern Chinese, to aid contemporary monastics interested in studying the Dharmaguptaka Vinaya but who might be daunted by the challenges of reading the Vinaya in classical Chinese. We are fortunate to have residents and Dharma friends who have the language skills to slowly unpack, unravel, and translate these precious teachings, which will serve the Abbey for years and generations to come. How did the Abbey acquire this collection? Venerables Chodron and Damcho heard about the publication of this series from Abbey friend and Vinaya teacher Venerable Heng Ching, who visited Longquan Monastery last year. She suggested that we write to request the books. Longquan Monastery’s publications department responded with enthusiasm and arranged to send the books from Beijing to the Abbey, refusing to accept any offerings for the books and shipping costs. 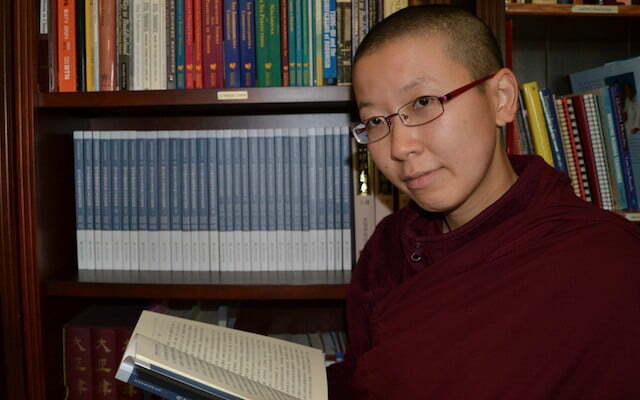 Why do Tibetan Buddhists study the Chinese Vinaya? The Buddha taught the Vinaya during his lifetime, and the monastic precepts, other guidelines, and their explanations were memorized and transmitted orally for hundreds of years before they were written down. As Buddhism spread across that great sub-continent and beyond, eighteen sub-schools developed, all with slightly different versions of the Vinaya. Basically, however, their content is the same. Most importantly, in addition to the texts, today, three living Vinaya lineages remain. These are the Mulasarvastivada, practiced in the Himalayan regions including Tibet and Mongolia; the Theravada, practiced principally in South and Southeast Asia; and the Dharmaguptaka, which spread through China into Korea, Vietnam, and Japan. Having these three living traditions means that people can still receive monastic ordination and practice the monastic discipline explained in the Vinaya. Of these three, only the Dharmaguptaka contains a centuries-old living tradition of full ordination for nuns (bhikshuni). The living tradition of bhikshuni tradition does not exist in the Tibetan community, and it has been re-established in Theravada countries only in the last twenty years. Ven. Chodron went to Taiwan to receive bhikshuni ordination in the Dharmaguptaka Vinaya in 1986, and for these reasons Sravasti Abbey practices the Vinaya within this school. Those words put into perspective all the inner and outer work we are doing Sravasti Abbey to help Buddha’s teachings flourish and create peace in a chaotic world. We are deeply moved by the generosity and support of our monastic friends in China. May all their efforts to propagate the Dharma continue to flourish! We are equally, if not more moved by our Tibetan teachers who so kindly teach us the Dharma so we can progress on the path to full awakening. Read more about the Vinaya and how the Abbey practices it in the Discover Monastic Life section of this website. See our report on Living Vinaya in the West when nuns of all Buddhist tradition came at the beginning of 2018 to learn from Vinaya Master Venerable Bhikshuni WuYin of Luminary Temple in Taiwan.